interactIVe was composed of seven sub-projects. Three sub-projects addressed the specification, design, and realisation of interactIVe applications. They analysed the use cases, defined requirements and developed the interactIVe applications. 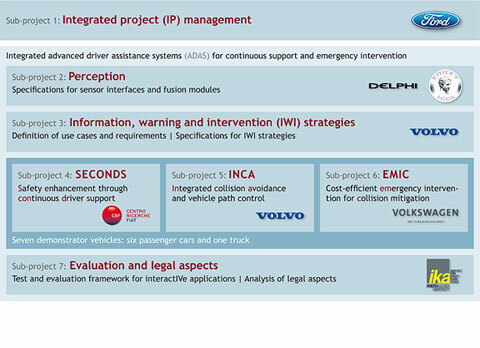 Later on, the relevant components, such as sensors, software modules, algorithms and hardware devices have been integrated and implemented into seven demonstrator vehicles by the sub-projects SECONDS, INCA, and EMIC.